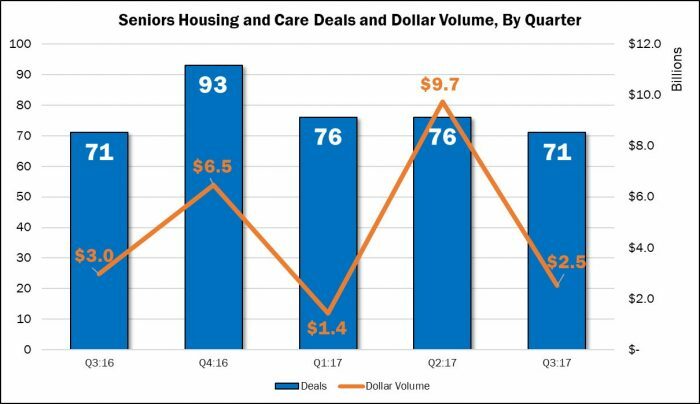 Although it remained above 70 deals for the quarter, seniors housing and care M&A activity fell to a year-low, tying with last year’s third quarter at 71 publicly announced transactions. Dollar volume also fell from its recent peak of $9.7 billion in the second quarter of 2017, recording $2.5 billion in transaction value based on disclosed prices. Increasingly, we have seen buyers prefer the one-off deals that come with one or two properties. 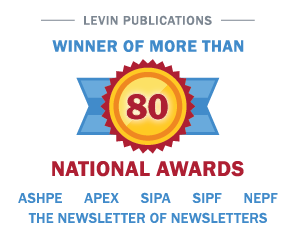 Those deals are easier to complete and are most appealing to strategic buyers. That is not to say that big deals weren’t announced during the quarter. Sabra Health Care REIT grabbed most of the attention, acquiring a 49% share of 183 Enlivant properties from TPG as well as 24 North American Health Care skilled nursing facilities on the West Coast, totaling well over $1 billion. However, we recorded no “mega deals” during the quarter, the largest being both of Sabra’s. At this current rate, 2017 is unlikely to surpass 2016 in deals (338 in 2016, compared with just 223 so far in 2017), but dollars seems more likely (currently at $13.6 billion for three quarters compared with $14.4 billion for all of 2016).